Let us begin with the definition of the French roulette which can be characterized as a European-style roulette game with a single-zero wheel. The only distinctive peculiarity of the French roulette is that it includes the "En Prison Rule" which allows gamblers to recover half of the bet in case it was an outside bet if the outcome of the spin is "0" or place your fate in the fortune's hands and leave the stake for the next spin of the roulette wheel (this option is also known as "all-or-nothing chance"). In fact the motherland of the roulette is France. Thus the term "roulette" arose from the French word for "small wheel". The invention of the French roulette game can be traced back to the 18th century and Blaise Pascal, a French mathematician who introduced it to the world. Afterwards the roulette has travelled with immigrants across the Planet and was admitted by gamblers from various countries. 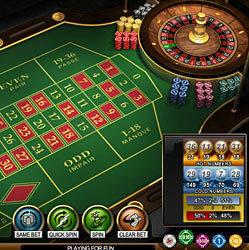 Therefore French roulette is a predecessor of European roulette and other alternatives of this game of chance. In the modern world the French roulette wheel is probably the most successful internationally recognized symbol of the excitement, luxury and prestige of top quality casinos. Regardless of the similarity and common basic principles of French and European roulettes, there are few distinctive peculiarities such as additional roulette game rules, playing area and wagering options. The first thing you will notice will be the different roulette table layout. Entire board of the French roulette table is red. Sometimes you may come across the roulette wheel located in the middle of the table. And although half of the numerals on the table from 1 to 36 are not colored in black color, they are yet considered as black. On the other hand, numbers on the French roulette wheel are typically of alternative black and red colors. French Roulette variation is played exactly the same way as European alternative of the roulette as both of them has a single zero on the wheel. However, there are few peculiarities which you should be aware of before proceeding to playing. For example, examine the rule of "La Partage" which allows you to retain the half of the bet, if you make an even money stake on certain single number and the plastic white ball lands on zero wheel pocket. In addition to standard wagering methods, French roulette bets have more options known as "call bets". At first sight "call bets" combinations of random numbers may seem strange but, if to look closer, logic of such bets will be evidently based on the arrangement of numbers on the French roulette wheel, rather than the roulette table.